The Javan cucumber (Alsomitra macrocarpa) is a vine that climbs the trees of tropical forests toward the canopy and sunlight. At great heights, it grows pods that contain hundreds of winged seeds. As the wind blows against the opening of the pods, the samaras are peeled away and released. Unlike many gliding seeds that use auto-rotation, the seed of the Javan cucumber vine exhibits a stable gliding flight with its paper-thin wings. The seed's design is efficient enough to achieve a slower rate of descent compared to that of rotating winged seeds. This aerodynamic advantage allows the seed to be easily carried by the wind several hundred metres. It is possible for the seeds to glide up to hundreds of meters, ensuring that they spread far from each other as well as the parent pod. This wide dispersal prevents the seeds from competing for resources once they fall to the ground and begin growing. The membranous wings of the Alsomitra macrocarpa fruit are very thin, varying from a few micron to some tens of microns. The wing has a swept and tapered planform, resembling that of a flying wing (see figure). Such a wing is one of the most efficient fixed-wing aircraft designs, since the entire body provides lift; however, without electronic stablisers, “flying wing” aircraft are difficult to control. 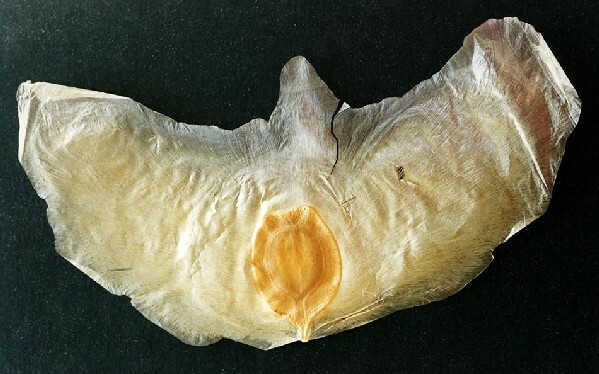 The Alsomitra macrocarpa fruit, however, has overcome this design weakness by having a center of gravity located close to (but in front of) the aerodynamic center of the wing due to the swept planform. At the same time, elastic deformation of the wing provides a twisted washout and dihedral, which helps it fly in a straight path and prevents “spiral instability” . This project aims to reveal the origin of this fruit's incredible flight capacity. We will achieve this through numerical modelling of the wing using computational fluid dynamics, and flow visualisation and particle image velocimetry techniques with real seeds and scaled-up models of the seeds. Azuma, A., 2012. The biokinetics of flying and swimming. Springer Science & Business Media.